Each year around the time Halloween decorations start showing up, we have a choice to immunize chil­dren against Influenza. 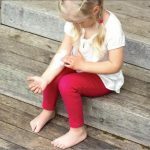 One time when I asked a family whether they wanted their child to receive the flu vac­cine, they responded that they only got their children the vaccines they HAD to have. What an interesting remark, I thought. Of all the vaccine preventable illnesses that pediatricians treat, flu is by FAR the most common illness that our patients will get. Because the influenza virus is constantly mutating and changing the way that it looks to our immune system, new vaccines are made every year to anticipate the newest strain that will cause the out­break. Influenza can cause a se­vere respiratory illness, high fever, and very significant body aches, among other symptoms. Sometimes, after influenza, patients end up with a pneumonia that can cause them to be very sick. These complications will most likely be avoided in someone who has received the influenza vaccine. I’ve heard a parent say, “I don’t want my child to get the flu vaccine because I don’t want them to get the flu.” Patients do NOT con­tract the flu from the influ­enza vaccine. It is possible, however, that they will re­ceive a couple of days of mild flu-like symptoms that could include fever and mild body aches. Approximately 10­20% of children will develop a fever after receiving the im­munization, a sign that their immune system has been stimulated. Keep in mind, though, that 80-90% of peo­ple receiving the flu immu­nization will NOT have any symptoms other than some soreness in the muscle at the site of the injection. In some cases, the actual flu virus is contracted near the same time that immunization is given and parents misplace blame on the flu shot’s ef­fects. For instance, you hear about a bunch of kids at your child’s school coming down with the flu so you go to your doctor’s office to get the im­munization, only to find out your kid (and you) have the flu the next day. This means the flu virus was already present. In fact, our bodies need between 2-3 weeks after the immunization before the protection is set in. Every year, approximate­ly 10% of the US population gets the flu (that’s about 30 million people—each year). For perspective, the state of Tennessee has about 6 mil­lion residents, so that would be everyone in Tennessee— five times. Now, don’t get me wrong, most people who get the flu don’t get THAT sick, just feel terrible for about a week or two. But that is 30 million people in the US that feel terrible. I don’t ac­cept that as just OK. Receiv­ing the immunization will in most cases either prevent or dramatically reduce the over­all flu illness that someone gets. The Flu immunization also prevents you from feel­ing terrible, from missing work, family Christmas/ holiday time, school and mid term exams (of course a lot of kids don’t mind this part), that hunting trip you had been planning, or that cruise to the Caribbean. You get the point, catching the flu is not unlikely, about 10% chance, each year. So when you consider there is a 1 in 10 chance of becoming ill, either a mild illness if you choose the immunization, or ………… a 1 in 10 chance of becoming much more ill and running the risk of severe complications, while not having any control as to when you will get ill, it seems the decision should be an easy one. Either deci­sion you make, you are mak­ing a choice, and accepting the same chances, but with deciding not to immunize against flu, you are accepting a much higher risk of severe illness and complication. I try to focus on the most likely scenarios when think­ing through the benefit of medical treatments (such as an immunization), but it is also important to focus on the scary stuff for just a min­ute. Every year more people die from the flu (and flu-induced illnesses like pneu­monia) in the US than from Hurricane Katrina, one of the worst natural disasters in recent US history. In 2003, one of the worst years of flu in recent history, over 45,000 people died from flu and flu related illness. Over 45,000 people, in America, in one year, from the flu! Most of the people that the flu makes very sick are the most vul­nerable among us—elderly, immune compromised, young children, asthmatics, etc. The vast majority of the above numbers of mortal­ity with flu are not among children, however, there are between 100 and 400 yearly deaths from flu in children. So does getting the flu vac­cine help to prevent Death? yes, and not only by prevent­ing illness in an individual, but also by helping to protect those around us that are in­capable of receiving the im­munization. There are a few people for whom the immunization is not suitable. These can include people with severe allergic response to previ­ous flu immunization, some people who have immune system problems (for ex-ample, people with cancer or autoimmune disease), some recipients of organ donation, and very young children, as an example. These are the people for whom contracting the flu can be the most dev­astating, but they do not have the choice to receive the im­munization. By choosing to immunize against flu when you are able, you not only protect yourself and your children, you also reduce the exposure risk of those around you who are unable to make that choice. While this is a very altruistic reason to immunize, let’s get back to the practical reasons, the most relevant for the every day life. At the end of the day, we as health care providers, and as parents, all want to do what is best for our pa­tients and our children. We want to protect them, keep them well, and help them grow up to become a benefit to their community. I would rather my patients (and my children) get a mild flu-like illness from the immuni­zation without the risk of complication, than to actu­ally get the flu, be very sick for two weeks, and then have the chance of all the other bad problems that can come along with the flu. Since the chances of either option are about the same, we have the power to choose the safer op­tion. After taking care of many patients with influenza, when someone tells me that they only want to get the vaccines that their kids absolutely have to have, my response is to put influenza on the top of that list. Please discuss with your pediatrician whether or not the influenza vaccine is right for your family.